The immediate provocation for this article was a recent discussion on illegal sand mining organized jointly by Moneylife and Awaaz Foundation last fortnight. At the discussion, speaker after speaker bemoaned the inability – or unwillingness – of the state to curb illegal sand mining (http://www.moneylife.in/article/illegal-sand-mining-is-endangering-bridges-awaaz-foundation-demands-full-investigation/47748.html). This was notwithstanding the good work done by some bureaucrats in controlling illegal sand mining in some areas – at least for a specific period of time. 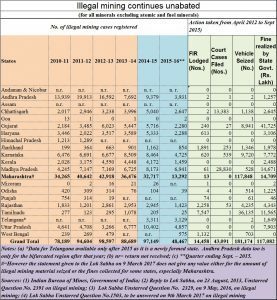 The gloom only grows when one examines the data on illegal mining with specific reference to Maharashtra. It remains the country’s biggest ‘haven’ for illegal mining (also see http://www.asiaconverge.com/2016/08/illegal-mining-thrives-even-today/). States like Karnataka, Andhra Pradesh and Goa — which have been pilloried for allowing illegal mining to flourish — are but small fry when compared to the goings on in Maharaashtra. Then look at another piece of information. Maharashtra is loath to file its illegal mining cases with the courts. It seems as if it would rather have the executive settle the cases, than permit judicial intervention. Just compare Maharashtra’s record with that of neighbouring Madhya Pradesh (MP). 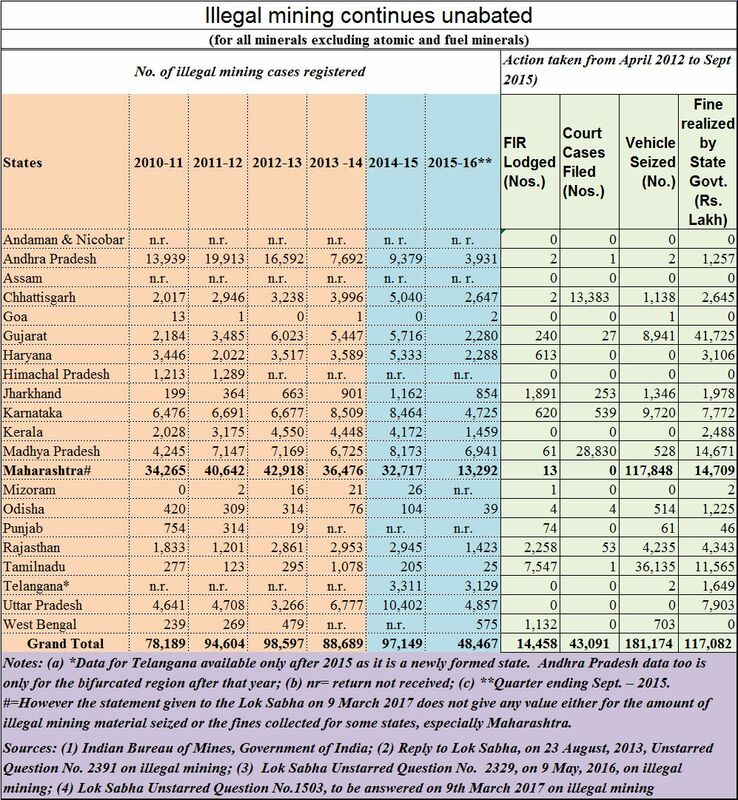 Even though MP had fewer cases of illegal mining, it has filed more First Information Reports (or FIRs, a key document filed by the police before a case can be filed before the courts) than Maharashtra has. Worse still, just go through the latest statement before the Lok Sabha (Unstarred Question No. 1503 of 9 March 2017). In this latest statement, Maharashtra has not furnished any values nor tonnages relating to the illegal mining cases registered (http://164.100.47.190/loksabhaquestions/annex/11/AU1503.pdf). 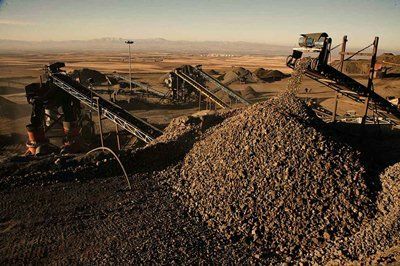 The attempt appears to be one where cases are registered, vehicles impounded, FIRs are filed, but no value of the mineral (or sand) mined illegally is documented. The paltry amount collected as fines appear to corroborate the view that political pressure is used to ensure that illegal mining continues. If anecdotal evidence is to be believed, it would also appear that illegal mining continues to remain one of the best ways to generate ill-gotten funds for political parties. The recent modifications in the laws relating to political funding shows that even though the government claims it is against corruption, political funding may become the best laundromat for converting ‘black’ money into ‘white’. First came the statement in the budget that political donations in cash of upto Rs.2,000 per transaction would be permitted. Remember how a chief minister explained away her political funds as Rs.1 donations from crores of people! Then case the notification that corporates could now donate funds to political parties anonymously. More surprisingly, while earlier laws allowed only a maximum of 7% of the net profits of a company to go towards political donations, the new laws have removed this ceiling. Result: companies can donate as much as they want – even if it is money that could have paid off loans from banks. The government appears to be saying that corporate governance does not matter. Shareholders don’t matter either (because all the profits can be given away to buy peace with political parties). Even banks are irrelevant – because banks can be repaid later, if at all. Overnight, political parties can now become excellent laundromats for converting ‘black’ money into ‘while’. Hitherto, this loophole existed only with agriculture (http://www.asiaconverge.com/2017/02/agriculture-as-laundromat-error-or-coverup/). Illegal mining too does not really matter. After all, it generates funds for political parties, as disclosures in Karnataka and Andhra Pradesh (with fewer registered cases of mining than Maharashtra) have shown. What matters is political funding! That is a dangerous conclusion to arrive at. But with the above mentioned numbers and the changes in laws, it is now up to the government to allay these fears. One way to do this is by reintroducing a ceiling on corporate donations towards political funding. Another way would be to actually move against illegal mining. Unfortunately, even though the spirit appears willing, the flesh seems to be weak. Next articleShift to cashless: Are Mumbai municipality’s finance, IT depts hoodwinking citizens?